Singapore has been stricken with an unexpected and unexplained spike in H1N1 swine flu cases. 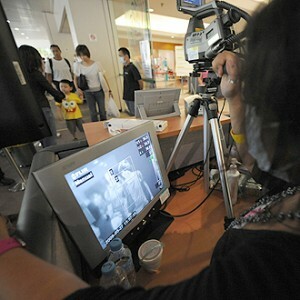 On June 29, Singapore spiked to 629 confirmed H1N1 cases – a sharp rise from 80-odd just 11 days before on June 18. All the signs point to a continuing increase in the number of H1N1 cases in the days ahead. Singapore is crammed with people, having imported millions of foreign laborers to boost Singapore’s economy during boom times. Now with the Singapore economy collapsing the country has a vast number of unemployed and disaffected foreign workers on its hands. The hygienic standards of these workers leave much to be desired. Singapore, through its importation of foreign labor has increased its population to 4,657,542 as of today – a growth of nearly 2 million people in the last 10 years. Singapore has a population density of 17,650 people per square mile. Singapore claims to be the Switzerland of Asia, but Switzerland’s population density is only 176 people per square mile – one percent that of Singapore. Tiny Singapore is pack jammed with people – an H1N1 (or economic/racial) time bomb, waiting to explode. In addition, Singapore families are returning from the June school holidays. last weekend, more cases are likely to surface by the end of this week, by which time the families would have already come into contact with many other people. So far, more than 4,600 first-year students at Republic Polytechnic are staying home this week instead of going to school, as latest figures show the institution has 66 confirmed H1N1 cases – the largest local cluster in Singapore. Similarly, close to 100 stock brokers from CIMB-GK Securities were told to stay home for seven days when two of their colleagues were diagnosed with the virus. So – if you are planning to visit Singapore, be sure to pack a flu mask. The H1N1 vaccines are likely to lower the immune system as the global conspiracists prepares for a major strike in an attempt to kill more than 30 million people by the end of the year. Edmund – Believe me, in the condition that the world is in today, almost anything is possible. Kill off enough people, and the unemployment problem might disappear.